Richard Dartley is a freelance assassin. Born Richard Woodgate, the son of parents who were member of the upper middle class, people who had considered every president since Truman to be an idiot, albeit for various different reasons, Dartley was himself hardly a sterling example of superiority as he was routinely a C student with little or no ambition. This included his stint in Vietnam where he learned to kill but wasn't that good at it. The murder of his father in Rio, when the man was supposed to be in Miami, brought out the truth that he had been for many years an agent for the CIA. The combination of death and duplicity brought a change to Dartley who suddenly wanted to be a part of the team fighting both communism and terrorism. On his own he trained diligently, helped by an uncle who was also a gun maker for hire. After a year of solid training, he was ready to offer his services. Unfortunately, the CIA didn't want him. Looking at his less-than-stellar history and misunderstanding his motivations, they replied that while they were willing to teach good men to kill, they weren't interested in teaching 'crazies to be good'. So, Dartley decided to go freelance, starting small at first and building himself a reputation. And it worked. Within a few years, he was considered one of the very best, able to sell his talents for $1 million. Still, his determination to follow in the footsteps of his father as best as he could continued such that he chose carefully his accepted assignments. He would only take contracts on men that were evil in his eyes and deserving of death. In a strange way, he would only kill those he felt his father might have killed. Three former Nazis, now powerful German industrialists, have taken a vow to eliminate a Turkish drug kingpin who is fouling with heroin the youth of Germany, not to mention the wife of one of the men. 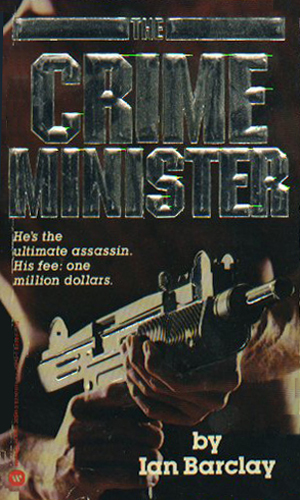 Their first assassin, however, fails miserably so they must turn to Dartley and pay his extremely high price before the drug lord can get his revenge. As the government of Egypt undergoes a drastic change with the overthrow of the democratic regime for a fundamentalist Islamic one, the world fears the new leader as he closes in on nuclear weapons. 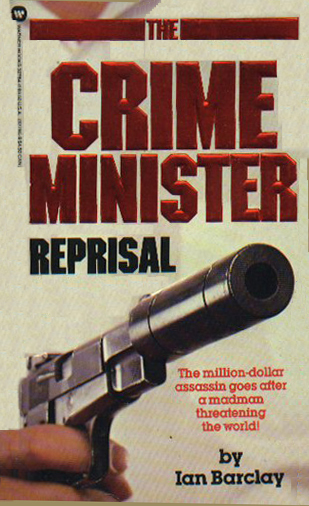 The Crime Minister is hired with the approval of the CIA to eliminate the man before he blows up the entire Middle East. In the steaming jungles of the Philippines, a warlord with plans for his own kingdom has begun his offensive, using as the catalyst for his recruitment the total banishment of all Americans. To accomplish this the fastest, he is simply having killed any he meets. This is bad for business so pro-West businessmen have to have him stopped. The expulsion of ten key oil men from Iran should have been the end of things now the Iranians were running the show but someone wanted these men not just out but dead as well. 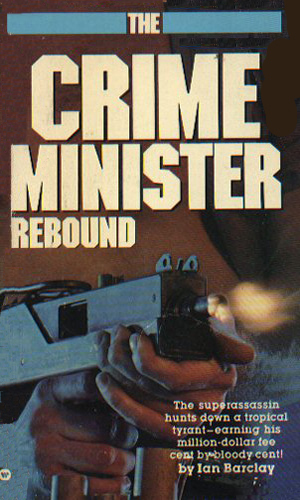 When five are killed in various 'accidents', one of the survivors turns to the Crime Minister for help. A splinter group of the PLO fears that a new global anti-terrorism treaty would be disastrous for their cause so they had to stop it from being signed. Their plan is to strike tourists across Europe. 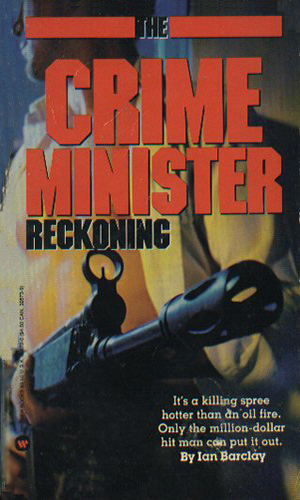 The Crime Minister is confronted with the carnage and takes a personal interest in stopping it, his way. 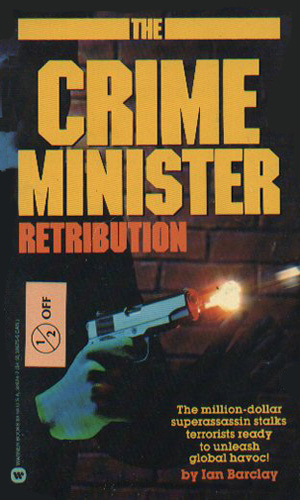 The quality of the Crime Minister series is not high, I'll admit straight out. The man is a mass of confusion and contradictions - a cold-blooded dealer in death while still being innocent in many ways. It doesn't make sense. And yet, like many a B movie I've seen, I couldn't stop reading. It held me, which is one of my signs for a good series, which it isn't. Talk about contradictions! Also a bit contradictory is the fact that most of the adventures has Dartley out to eliminate bad guys and others has him trying to keep someone alive. But don't judge this series too harshly. Just enjoy pure junk-food pleasure and don't expect more than a greasey burger and fries.